Katy Perry brings her Witness tour to Sydney’s Qudos Bank Arena. JUST four years ago, Katy Perry mania swept Australia with the kind of hype that whirls around only the world's biggest pop stars. But now, it has stalled. Mass hysteria has been replaced with Westfield appearances and slashed ticket prices. Following last year's flop release of Perry's fifth album Witness, the singer persisted with a world tour. And as the show rolled into Sydney this week, ticket prices were slashed to just $65, down from $130-$150, in a desperate last minute sale to fill the four performances scheduled at Qudos Bank Arena. While the fire sale ensured the 20,000 seats were mostly filled, the show only lived up to the bargain basement price and lumbered towards 11.20pm on Monday evening. A late school night is forgivable and welcome when the concert is worth it. But Perry's wasn't. The two-hour show drags to a close, nearing midnight on Monday. It's almost unfair for Perry that Pink performed at the same arena just two days earlier. The rescheduling of four of the Beautiful Trauma singer's shows due to illness made daily national headlines. The country's desperation to see the singer was clear - even without publicity appearances. Her high-energy, complex and relentless shows set a standard that only exposed the sudden weakness of Perry's pop star power. It's a swift fall for the star who, only four years ago, was one of the country's favourite singers, attracting hysteria when she made a string of visits to our shores. 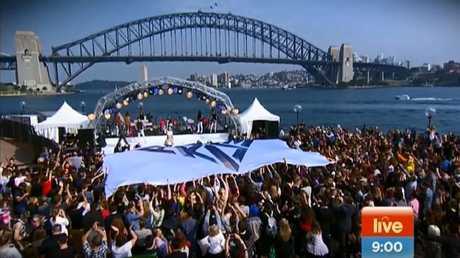 On a whirlwind tour in 2013 to promote the release of her fourth album Prism, Perry was welcomed by Channel 7's Sunrise with an outdoor broadcast at Sydney Opera House. Perry - who has sold 40 million albums - performed all her hits on the iconic forecourt, the white sails and Harbour Bridge swooping behind her. Her lead single on the album Roar became the biggest ever single in the country. Just months later in 2014, she returned to Australia to promote the Prismatic tour and clips of her presenting the weather on breakfast television made headlines and went viral. Before she even arrived later that year for the actual tour, four more shows had been added due to high demand. But four years later, the hype has waned. No extra shows. Just ticket prices being slashed. Katy Perry mania … The singer welcomed by Sunrise at the Opera House. Perry has been candid about the flop her latest album Witness became. She told Vogue Australia last month she suffered "situational depression" and spent time in a mental health retreat after the poor commercial performance of the album that failed to click with critics and fans.
" … I put so much validity in the reaction of the public, and the public didn't react in the way I had expected to … which broke my heart," she said. Fans grew tired of her attention-seeking exploits. Public digs at Taylor Swift to add fuel to their ongoing schoolgirl feud became embarrassing to read about. Wanting to move away from the songs about teenage love and summer sunshine that made her famous, Perry declared she had gained substance and political perspective and would now only produce "purposeful pop". This pledge was followed by the two singles Bon Appetit and Swish Swish. Fans lost interest. "Are you still with me Sydney?" Perry asked the crowd as the two hour show chugged towards midnight. "But the real question is: are you wide awake?" It was a concert for her smaller fans. Bratty comedic bits and banter about Australian abbreviations dragged. Attempts at creating viral moments by pulling a young fan up on stage to sing and "make a wish on a shooting star" were empty. Perry told the audience she was inside the same arena days earlier to watch Pink explode on the stage. ‘Are you still with me Sydney?’ … Katy’s latest visit to Australia hits a slump. Tickets to Perry’s four Sydney shows have been slashed in a last minute sale.